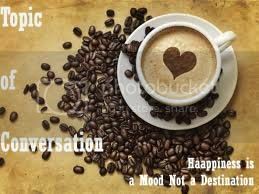 Happiness Is a Mood Not a Destination: Topic of Conversation; a link up! As bloggers, we like to share our fun experiences, our DIY projects or recipes. While it's great to get to know a bloggers personality, especially if ours is very similar, it's also nice to connect on a deeper level though. A level where we connect through encouragement, advice, or prayer. Sometimes we dont get to see the struggles or same accomplishments. This link up will do just that! Each week a new question will be posted. Some questions will be super easy and some may make you think. 3. Grad the button and tell your friends to come on over! 5. Sit back, grab some coffee and talk to a friend! love your new design (I mostly read on my iPad, so sorry if it's been up for a while!) and also so excited you're starting the linkup! if you are participating in the linkup, where's the linky tool and when will the posts link?